On March 3rd Nona Melnick from Montessori Children’s House in Horsham was the Education Specialist at The Horsham Library. 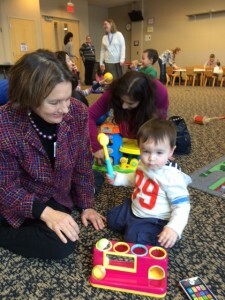 The Library has a multi-week series of programs which combines a playgroup experience for children ages 12 – 36 months with informal parenting education. During the sessions, resource people from local organizations who are experts in various child development issues are on hand to informally talk with parents while their young children play with a special collection of toys provided by the library. Parents had the chance to ask questions, discuss concerns, and share ideas with each other. During the session, Nona discussed educational concerns with many of the parents.